Richard – who modestly calls himself a “jobbing geomancer” – will lead two sessions at the WAVES conference: one on Geopathic Stress, and one on Earth Acupuncture. Richard Creightmore MA (Oxon) BAc has been in practice as a professional geomancer since 1986. He holds degrees in both geography and acupuncture, and his geomantic background includes training in dowsing, classical feng shui, space clearing, sacred space design, stone circle constructon, and extensive journeys into the geomantic traditions and landscapes of Britain, China, India and Aboriginal Australia. 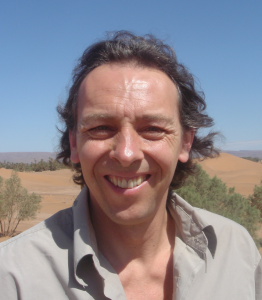 Richard specialises in water divining, medical feng shui, and earth-acupuncture to heal landscape trauma and resolve geopathic and geopsychic stress. He has been active in curriculum and educational standards development with both the Feng Shui Society and the British Society of Dowsers, and a Visiting Lecturer in Geopathic Stress and Earth Acupuncture at the Department of Complementary Medicine, University of Westminster. He is Principal of Beech Hill College / Land and Spirit in Ashdown Forest, Sussex, and consults and teaches in Britain and worldwide. Earth Energies are considered of crucial importance in many geomantic traditions, and the nature and quality of the various currents passing through and beneath a location can be a fundamental determinant of the health, power and luck of its inhabitants. Richard will present an overview of the subject, from the Ming dynasty Feng Shui text Shui Peng Ba Zhen Fa / Eight Needles of the Water Compass Method through to contemporary understanding of the causes, signs and symptoms of geopathic stress. Richard will present a range of traditional and contemporary remedies for geopathic stress, from avoidance and shielding protocols to curative earth-acupuncture techniques for healing landscape trauma and resolving geopathic and geopsychic stress.